About three months ago, I wrote on this blog about 'the pros and cons of precedent.' As a case-study, I referred to efforts by UN Member States to re-shape the upcoming third Biennial Meeting of States (July 14-18) to consider implementation of the UN Programme of Action to Prevent, Combat and Eradicate the Illicit Trade in Small Arms and Light Weapons in All Its Aspects. The previous two biennial meetings - in 2003 and 2005 - had not been too successful in monitoring implementation of the Programme of Action. This in turn contributed to the failure of the 2006 Review Conference to assess the overall impact of the agreement and to sketch a plan for its strengthened future implementation. In response to all of this, the Chair of the third biennial meeting - the Ambassador of Lithuania to the UN in New York - made some very sensible suggestions about how to make this next meeting more effective. He proposed focusing on a small number of issues on which there was already a good deal of international consensus (with a special focus on international cooperation and assistance and national capacity-building). He appointed facilitators on these issues, who then produced useful discussion-papers to prepare the debate. And he insisted that the meeting should aim to produce a consensus final report that would include recommendations on next steps and on a practical implementation agenda. In my April 8 'precedent' post, I commented on how unusual it was to see such sensible proposals for change gain broad support given the almost reflexive attachment of disarmament diplomats to doing things as they have been done before. Now, however, although the Chair's proposals still seem to enjoy the support of the vast majority of UN Member States, cracks are beginning to appear in the new plan. A small number of States - perhaps only two or three, but possibly more - are beginning to question the efficacy of the proposed new approach. The Chair is engaged in intensive bilateral diplomacy to see if he can address their concerns. This presents a challenge to the international community; a test, if you like, of its resolve to deal seriously with the humanitarian impact caused by the illicit trade in, and misuse of, small arms and light weapons, which are used to take the lives of about 300,000 people every year and to cause untold misery to millions more. Although they started out as such, efforts to deal with small arms and light weapons within the framework of the UN Programme of Action are, unfortunately, no longer based on consensus. Following the 2006 Review Conference, the United States cast the only vote in the UN General Assembly's First Committee against holding another biennial meeting of States this year. When the third biennial meeting begins (without the U.S.) on July 14 at 10am (EST), diplomats may again be faced with the challenge of what to do if a small number of States refuse to play by the new rules that are being proposed. The choice, at least, would seem to be a simple one: Give in to pressure from a small minority of States and revert to an approach that has twice proven less than effective. Or, go with what the vast majority of States wants - an effective, focused meeting that stands a much better chance of advancing international efforts to curb the illicit small arms trade and of sketching out a much-needed agenda for future action. Watch this space to see which way the cookie crumbles. 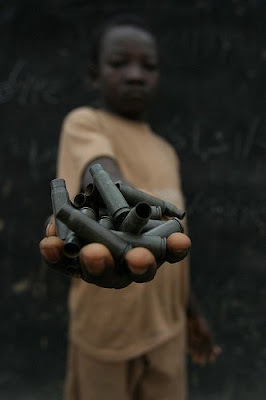 Photo Credit: "Demobilize child soldiers in the Central African Republic" by hdptcar on Flickr.